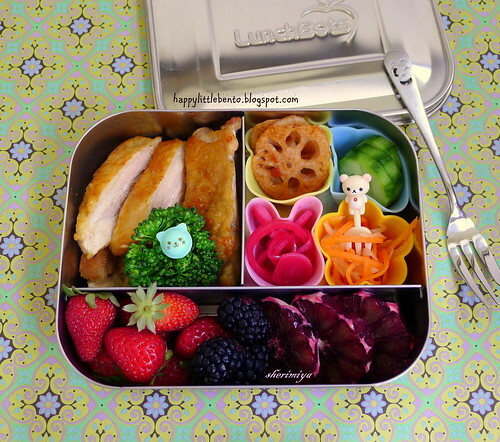 Pan-Seared Chicken in LunchBot Bento, a photo by sherimiya ♥ on Flickr. I never buy skin-on chicken these days, but I wanted to try cooking it in a hot pan to make crispy skin. It was tasty, but not really worth the splattering oil factor. I'd rather have oven-broiled tebasaki, which also gets nice and crispy, but behind the oven safety glass! Still, my little girl liked it, of course. Chicken is her favorite food, I think, after bread. And cheese, and ice cream. 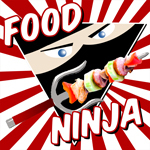 Also in the LunchBot Trio: steamed broccoli sprig, fried lotus root (renkon), pickled cucumber / onion / carrot / daikon, sweet baby organic strawberries, blackberries, and blood oranges.